Turn any window into a room with a view by adding a bird feeder outside of it. 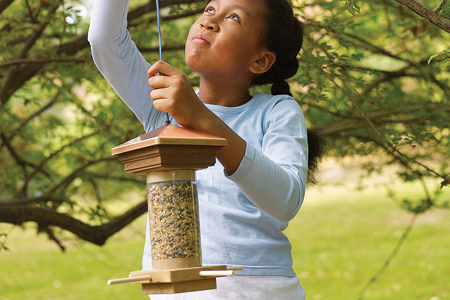 These DIY bird feeders are simple, but will have the birds begging for more. • You might remember this easy, popular pine cone bird feeder from your summer camp days. Anyone can create one of these from a pine cone, peanut butter, string and seeds. Though this can cause some mess, this is a perfect introduction to making your own bird feeder. Changing the bird seed will affect which type of birds will flock to your yard. 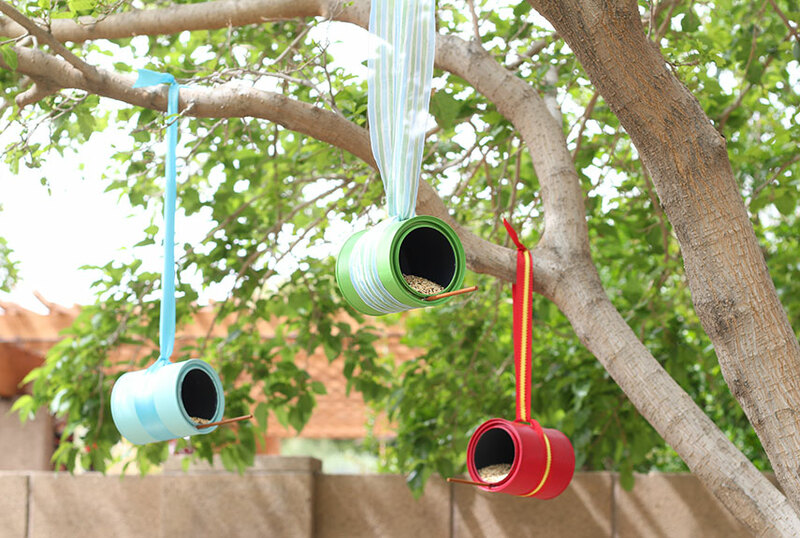 • This colorful, creative bird feeder idea helps you recycle your old empty paint or coffee cans. Choose colors that complement your home’s exterior or outdoor furniture. • Who knew that PVC pipes can be used to help attract hummingbirds? Paint the pipes as you please, but make sure that the paint is durable as the outdoors can affect the color more rapidly than an indoor project. Then, add wire and glass beads for a whimsical, decorative touch to any yard or garden. • If you’re itching to break out woodworking tools, this DIY bird feeder will make for a great weekend project. Kids can help out with measuring and filling the feeder, so you can focus on making the proper wood and wire cuts. This feeder makes use of household items, but some items like wire and wood pieces will need to be purchased from your local home store. • If you’re interested in using all natural ingredients for your feeder, most of this simple project is perishable. After the bids have had their fill, you can use the orange rind in a compost to keep this feeder even more environmentally friendly. If you plan on composting, be sure to rid the rind of all peanut butter first. • Here’s a homemade bird feeder that provides a perch or two for the birds to stand on while they eat. You can build this one easily using repurposed kitchen materials and bird seed. To add some bright color, paint the spoons to accent your feeder and backyard.